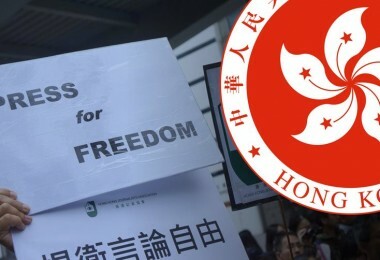 The Hong Kong government’s proposal to shorten polling hours in District Council and Legislative Council elections is most likely to affect pro-democracy voters, according to data from recent exit polls conducted by the University of Hong Kong’s public opinion programme (HKUPOP). 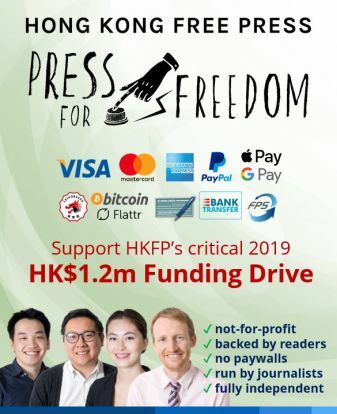 Last month, the government launched a public consultation on Hong Kong’s electoral arrangements, including a proposal to shorten the opening hours of polling stations by half an hour or one hour in either the start or close of poll, or both. 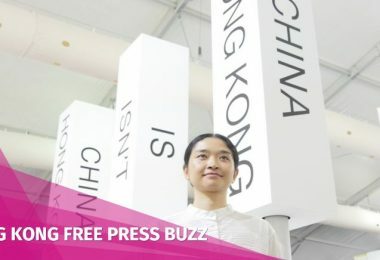 To understand if there is a significant difference between choices of voters who cast their votes at different hours of the day, FactWire has analysed exit poll data from the 2012 and 2016 Legco elections collected by HKUPOP. Results show that the pro-democracy camp tends to have the highest hourly vote shares in the last few hours of voting. For example, in 2016, as much as 64 per cent of all exit poll respondents voted in the last hour were pro-democracy voters, while in 2012, they accounted for 60 per cent and 59 per cent in the final two hours. 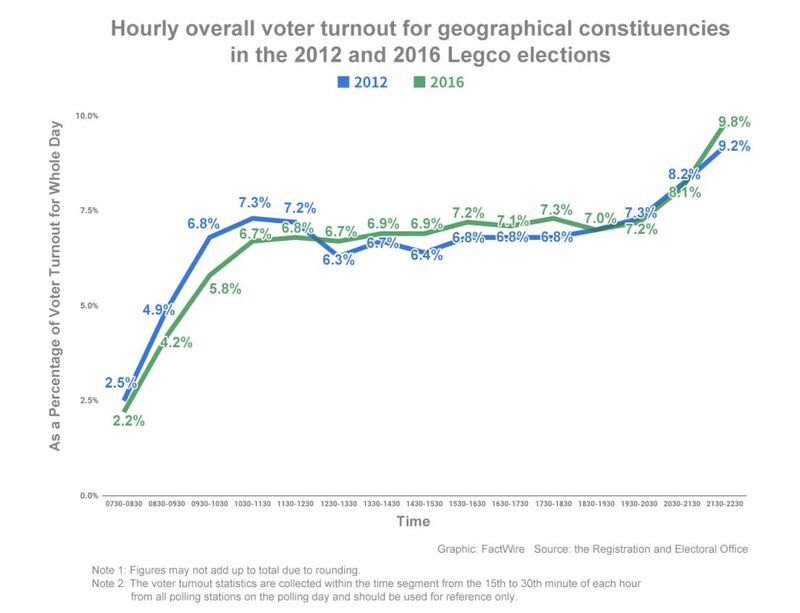 Hourly overall voter turnout for geographical constituencies in the 2012 and 2016 Legco elections (Graphic: FactWire; Source: the Registration and Electoral Office). 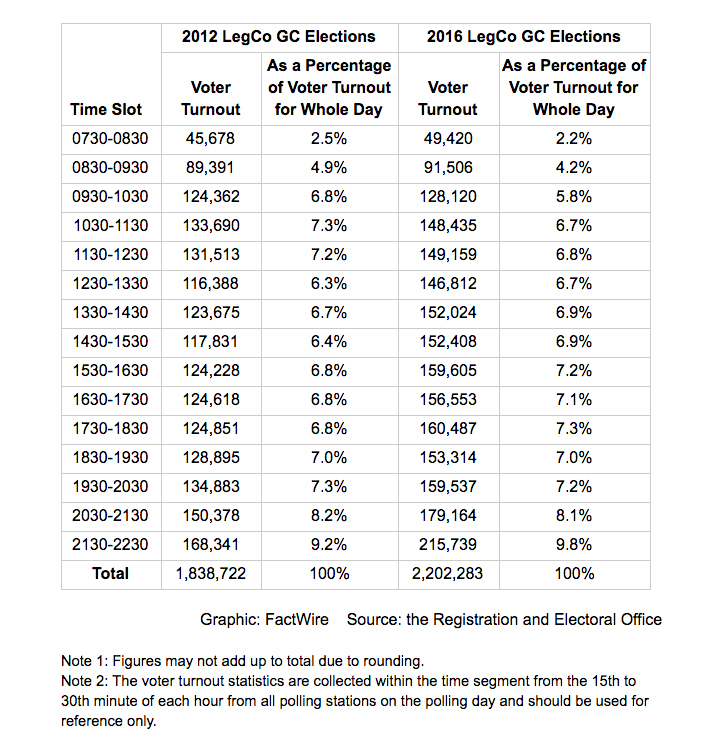 Data from the Registration and Electoral Office also shows that voter turnout rates in the last hour (i.e. 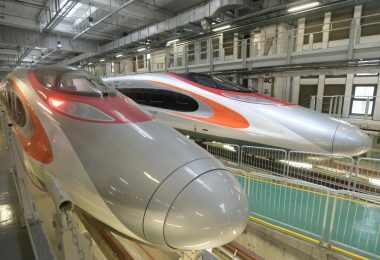 from 9:30 to 10:30pm) were the highest in the day in both the 2012 and 2016 Legco elections, at 9.2 per cent and 9.8 per cent respectively. A line graph showing hourly overall voter turnout for geographical constituencies in the 2012 and 2016 Legco elections (Graphic: FactWire; Source: the Registration and Electoral Office). The exit poll data was adjusted by weighting. Most vote share figures have a statistically significant difference at a 95 per cent confidence level, which were marked with an asterisk in the graphs (note: a 95 per cent confidence level indicates that 95 out of 100 repeated random samples from the same population lie within the certain standard error). 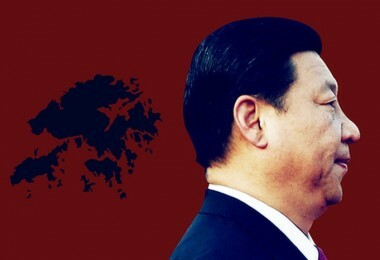 FactWire divided the candidate lists running in the 2012 and 2016 elections into pro-establishment and pro-democracy camps in order to analyse how voters voted in each hour (data from the first two hours of voting was excluded due to insufficient samples). 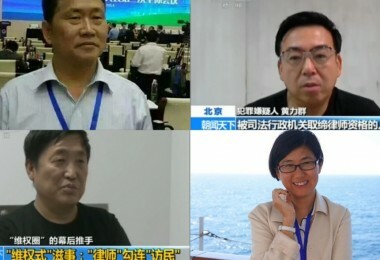 All candidate lists running in the 2012 Legco election were divided into pro-establishment and pro-democracy camps (Graphic: FactWire). All candidate lists running in the 2016 Legco election were divided into pro-establishment and pro-democracy camps (Graphic: FactWire) (Note: candidates not chosen by exit poll respondents were excluded). 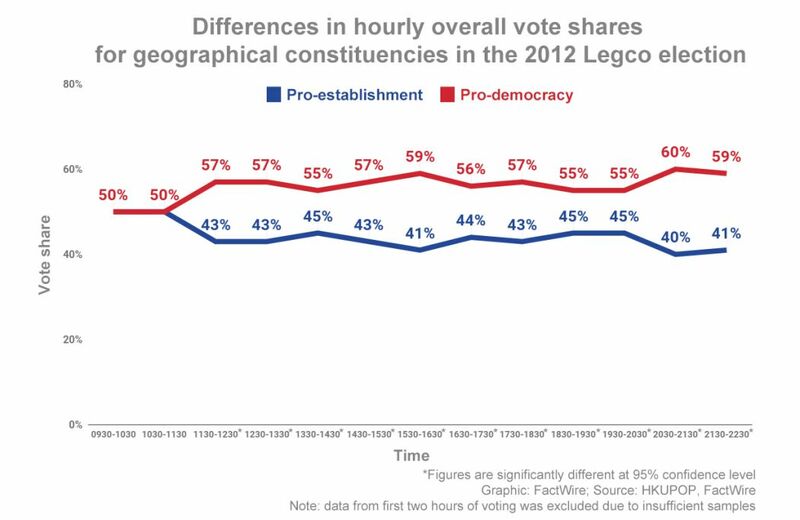 In the geographical constituencies in 2012, the vote started off with a 50-50 split between pro-establishment and pro-democracy voters from 9:30 to 11:30am, but then the gap began to widen, as the latter’s share of the vote remained at around 55 to 57 per cent by 8:30pm. In the last two hours before polls closed, their hourly vote shares increased to all-day highs, at 60 per cent and 59 per cent respectively. 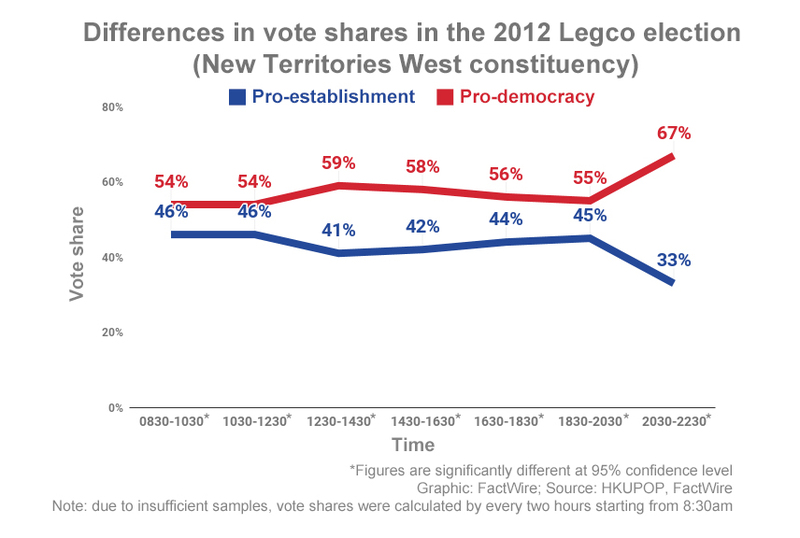 Differences in hourly overall vote shares for geographical constituencies in the 2012 Legco election (Graphic: FactWire; Source: HKUPOP, FactWire) (Note: data from the first two hours of voting was excluded due to insufficient samples *Figures are significantly different at 95 per cent confidence level). 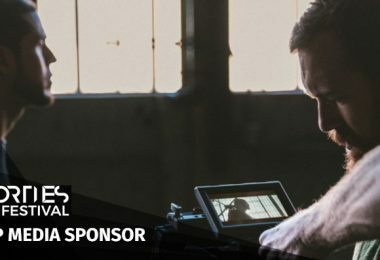 In the district council (second) constituency, also known as the ‘super seats’, pro-establishment candidates started off with the largest hourly shares of the vote, accounting for 55 per cent and 52 per cent in the first two hours. It then dwindled and was overtaken by the opposition. By 10:30pm when voting ended, their hourly vote shares remained at around 52 to 55 per cent. 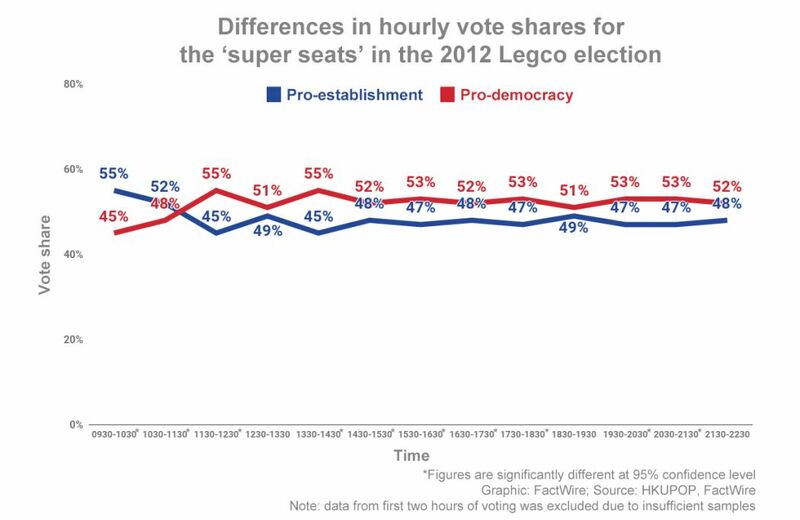 Differences in hourly vote shares for the ‘super seats’ in the 2012 Legco election (Graphic: FactWire; Source: HKUPOP, FactWire) (Note: data from first two hours of voting was excluded due to insufficient samples. *Figures are significantly different at 95 per cent confidence level). 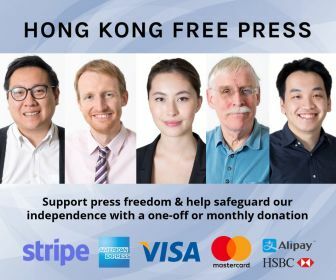 Meanwhile in the 2016 Legco election, the trend of increasing support for pro-democracy candidates towards the close of poll was even more prominent. 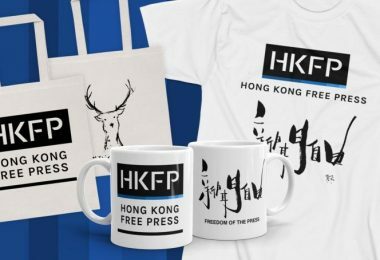 From 9:30am to 3:30pm, the pro-democracy camp’s vote share in the geographical constituencies was around 51 to 54 per cent. It then gradually increased to 60 per cent as the vote headed into the night. 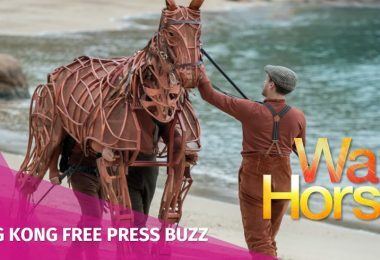 Their share rose to all-day high of 64 per cent in the last polling hour. 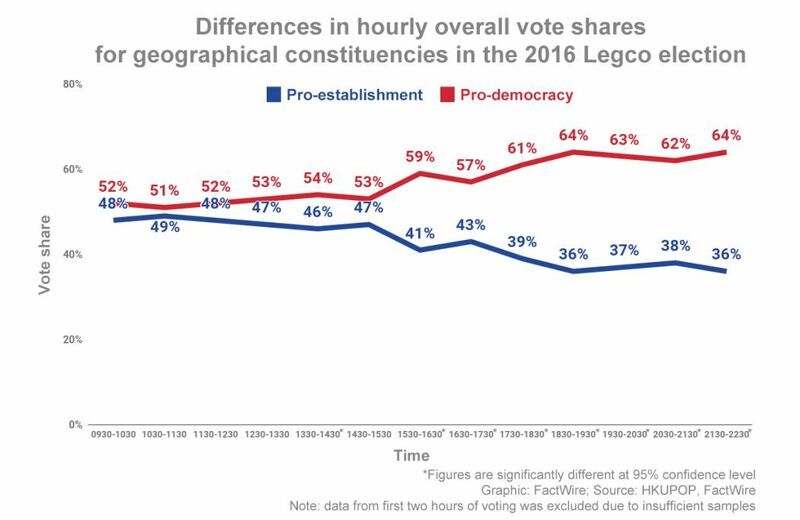 Differences in hourly overall vote shares for geographical constituencies in the 2016 Legco election (Graphic: FactWire; Source: HKUPOP, FactWire) (Note: data from the first two hours of voting was excluded due to insufficient samples. *Figures are significantly different at 95 per cent confidence level). The territory-wide ‘super-seat’ contest also witnessed a similar pattern as the pro-democrats started off with winning 59 per cent of the vote in the first hour (i.e. from 9:30 to 10:30am). Their hourly shares decreased to around 53 per cent in the following few hours but then surged to and remained above 60 per cent from 2:30pm. In the last two polling hours, pro-democrats’ hourly vote shares rose to the highest in the day, at 66 per cent and 67 per cent. 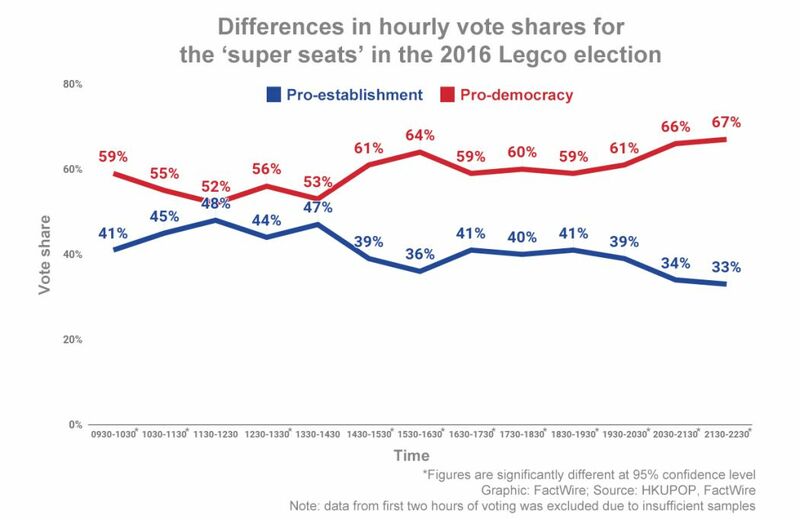 Differences in hourly vote shares for the ‘super seats’ in the 2016 Legco election (Graphic: FactWire; Source: HKUPOP, FactWire) (Note: data from first two hours of voting was excluded due to insufficient samples. *Figures are significantly different at 95 per cent confidence level). FactWire also calculated the vote shares in different polling hours in each geographical constituency. 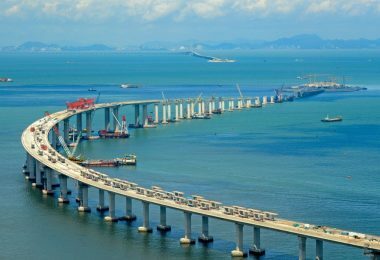 In the 2012 Legco election, the biggest differences in vote shares lied in the last two hours of voting in the New Territories West constituency, with a 67-33 split between the pro-democracy and pro-establishment camps. 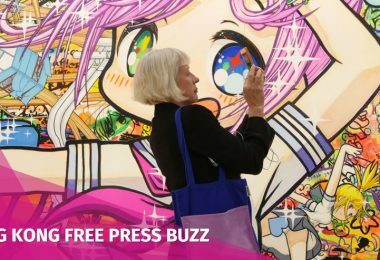 The former’s shares never exceeded 60 per cent in the preceding hours (due to insufficient samples, vote shares were calculated by every two hours starting from 8:30am). 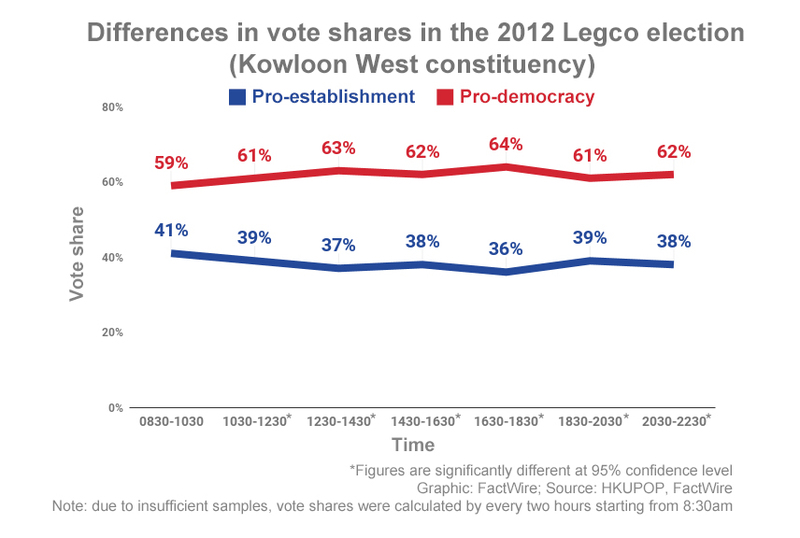 Differences in vote shares in the 2012 Legco election (New Territories West constituency) (Graphic: FactWire; Source: HKUPOP, FactWire) (Note: due to insufficient samples, vote shares were calculated by every two hours starting from 8:30am. *Figures are significantly different at 95 per cent confidence level). 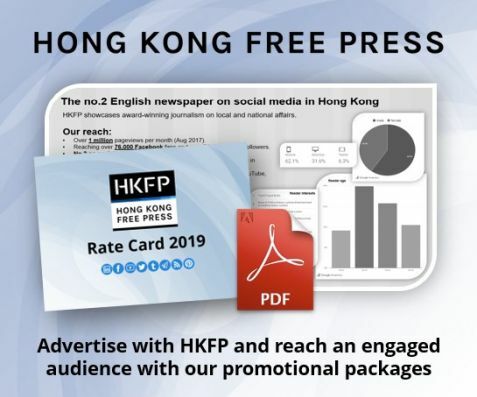 In Kowloon East and Kowloon West, the pro-democrats’ vote shares also reached the highs of 61 per cent and 62 per cent respectively in the last two polling hours. 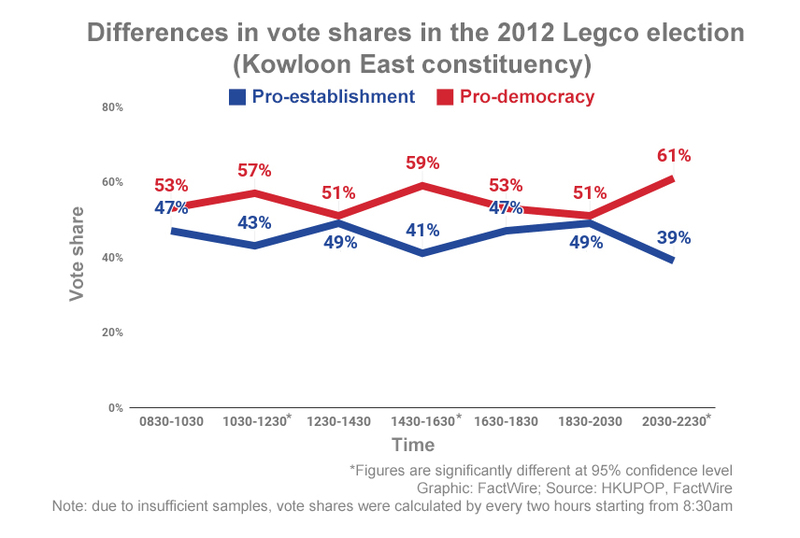 Differences in vote shares in the 2012 Legco election (Kowloon East constituency) (Graphic: FactWire; Source: HKUPOP, FactWire) (Note: due to insufficient samples, vote shares were calculated by every two hours starting from 8:30am. *Figures are significantly different at 95 per cent confidence level). 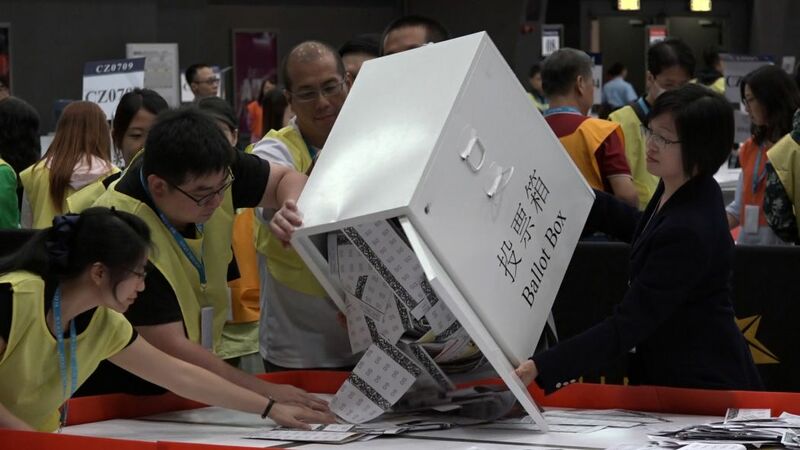 Meanwhile in Hong Kong Island and New Territories East, there was a clear swing to the pan-democrats in terms of the afternoon vote shares as more pro-democracy voters turned up to vote into the night. 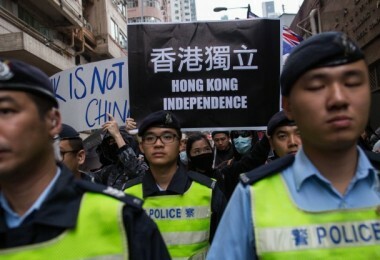 On Hong Kong Island, the pro-establishment camp respectively took 56 per cent and 53 per cent of the votes cast in the first two time segments (i.e. 8:30 to 10:30am and 10:30am to 12:30pm), but was soon overtaken by the opposition in the afternoon. 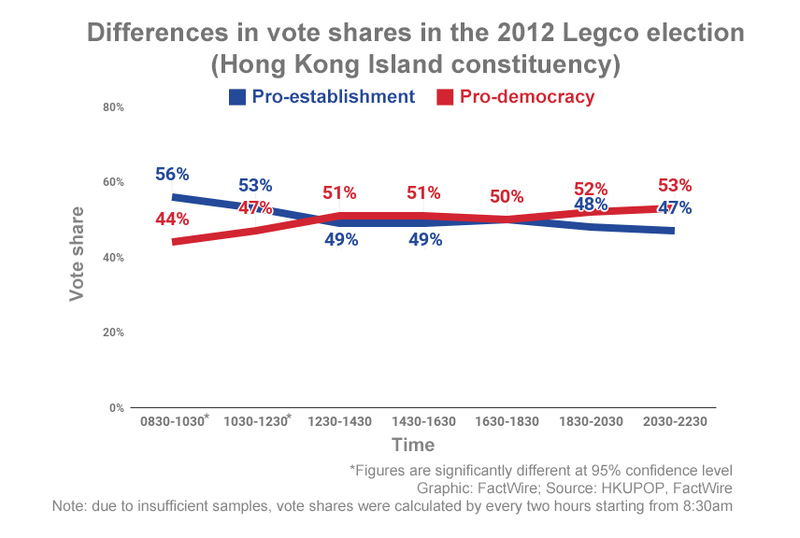 Differences in vote shares in the 2012 Legco election (Hong Kong Island constituency) (Graphic: FactWire; Source: HKUPOP, FactWire) (Note: due to insufficient samples, vote shares were calculated by every two hours starting from 8:30am. *Figures are significantly different at 95 per cent confidence level). 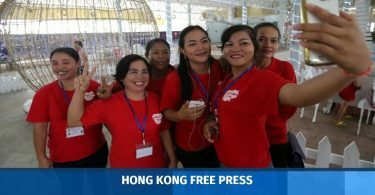 The pro-establishment camp also started strong in New Territories East but soon fizzled out and was overtaken by the opposition whose vote shares stayed between 54 to 62 per cent. 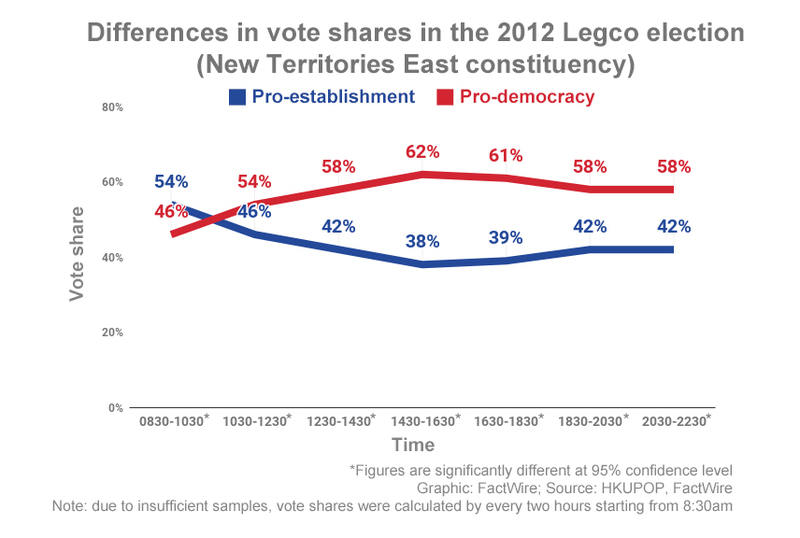 Differences in vote shares in the 2012 Legco election (New Territories East constituency) (Graphic: FactWire; Source: HKUPOP, FactWire) (Note: due to insufficient samples, vote shares were calculated by every two hours starting from 8:30am. *Figures are significantly different at 95 per cent confidence level). 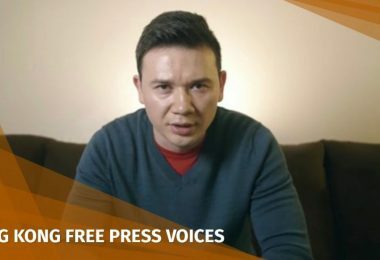 In the 2016 election, exit poll data from all five geographical constituencies again shows significant vote shares for pro-democracy candidates in the evening, ranging from 58 per cent to 69 per cent. (vote shares were calculated by every five hours from 7:30am in order to meet sampling requirement). 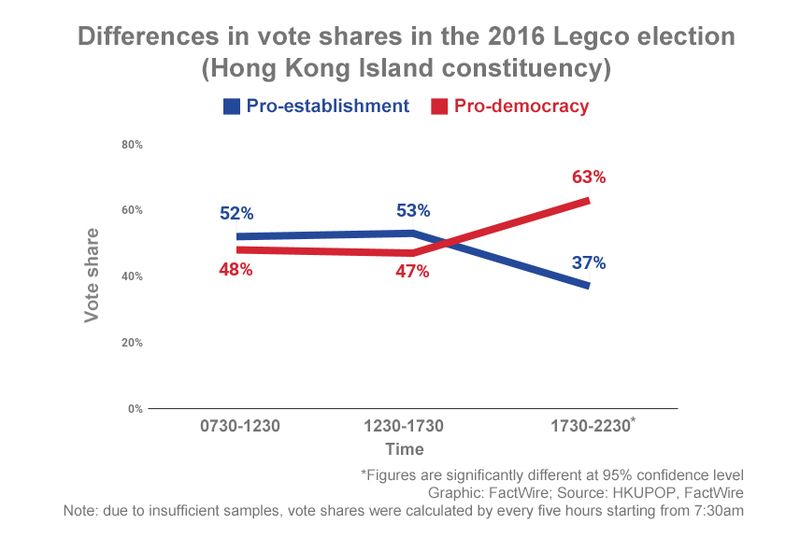 Differences in vote shares in the 2016 Legco election (Hong Kong Island constituency) (Graphic: FactWire; Source: HKUPOP, FactWire) (Note: due to insufficient samples, vote shares were calculated by every five hours starting from 7:30am. *Figures are significantly different at 95 per cent confidence level). 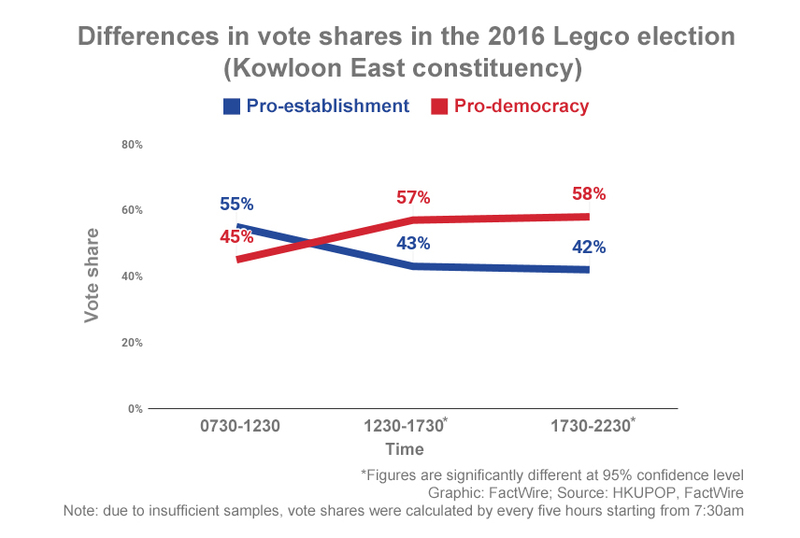 Differences in vote shares in the 2016 Legco election (Kowloon East constituency) (Graphic: FactWire; Source: HKUPOP, FactWire) (Note: due to insufficient samples, vote shares were calculated by every five hours starting from 7:30am. *Figures are significantly different at 95 per cent confidence level). 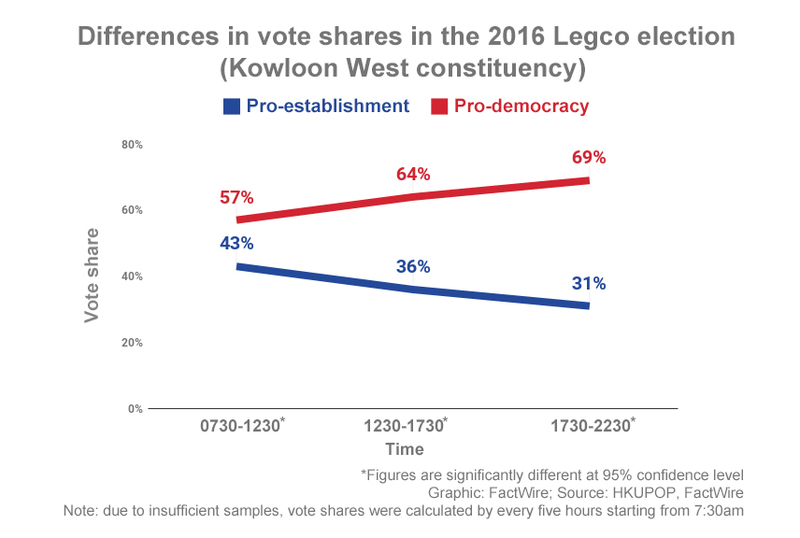 Differences in vote shares in the 2016 Legco election (Kowloon West constituency) (Graphic: FactWire; Source: HKUPOP, FactWire) (Note: due to insufficient samples, vote shares were calculated by every five hours starting from 7:30am. *Figures are significantly different at 95 per cent confidence level). 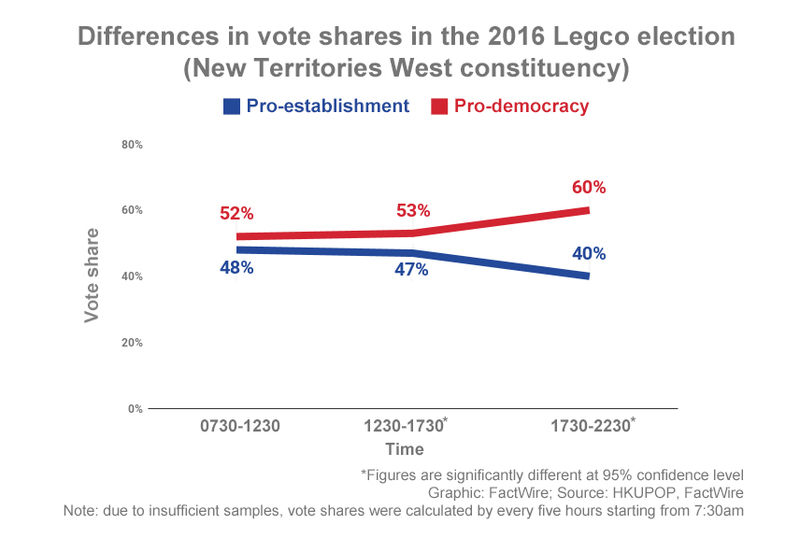 Differences in vote shares in the 2016 Legco election (New Territories West constituency) (Graphic: FactWire; Source: HKUPOP, FactWire) (Note: due to insufficient samples, vote shares were calculated by every five hours starting from 7:30am. *Figures are significantly different at 95 per cent confidence level). 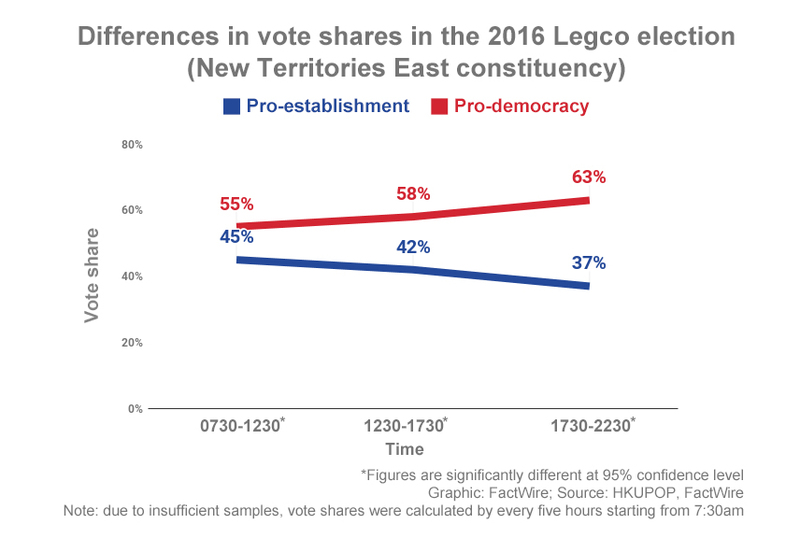 Differences in vote shares in the 2016 Legco election (New Territories East constituency) (Graphic: FactWire; Source: HKUPOP, FactWire) (Note: due to insufficient samples, vote shares were calculated by every five hours starting from 7:30am. *Figures are significantly different at 95 per cent confidence level). The Constitutional and Mainland Affairs Bureau has launched a public consultation on 13 November proposing changes to the regulations and arrangements regarding election advertisements on social media, election surveys and polling hours. One recommendation put forward by the government is to cut the opening hours of polling stations, which currently run from 7:30am to 10:30pm, by either starting or finishing, or both, half an hour or an hour earlier. 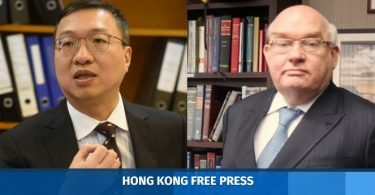 In a special Legco meeting last week discussing the consultation, which will end on 29 December, the bureau’s under secretary Andy Chan Shui-fu said the government was open to shortening the polling hours as long as society could reach a consensus. The REO would implement the necessary adjustments as an administrative measure, which does not require any legal amendment, he added. In response to lawmakers’ questions on the potential impact on voters who need to work on election day, Chan said not everyone had to work 15 hours a day and that the government could make special arrangements with employers. 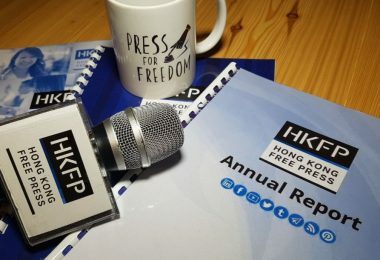 The HKUPOP exit polls for the 2012 and 2016 Legco elections were conducted by sampling voters at selected polling stations according to prescribed time segments and selection procedures on election days. In 2012, the programme collected 14,917 successful samples from 105 polling stations, in addition to 190 partial samples and 12,903 refusals, achieving a response rate of 53.3 per cent. Some of the data was later found to be questionable and therefore discarded, lowering the number of surveyed polling stations to 95 and the corresponding samples to 13,663. Exit poll data for the 2016 election consists of 3,041 samples collected from 50 polling stations, with a response rate of 52.2 per cent. It also includes 288 partial samples and 2,494 refusals.